Our advanced knee pain relief program is the product of years of research and study. After thousands of case histories we beleive that we have arrived at the most effective treatment program available for damaged and worn knees. We even have seen considerable success with knee conditions that pervioulsy had only surgical options. Knee pain sufferers are a tough group. Most have been dealing with daily pain and discomfort for years. 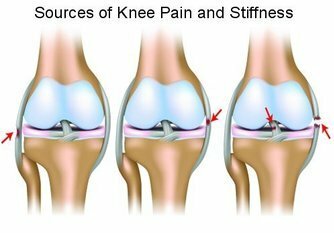 Usually, there is a steady decline in knee condition (and a rise in pain) until finaly it cannot be ignored any longer. After waiting so long to seek help, many patients were told they would require knee replacement or other surgery as their only hope. They come to our program looking for a better option. Our unique clinical program is a different approach to knee pain. While every case is different, generally we seek results without resorting to pain medications or surgery. We relieve pain by using the body’s natural healing power. A knee that has fully healed naturally is a very favorable outcome from a healthcare standpoint. After a short treatment program, you could be joining many of our patients who have regained their mobility, full activity levels, and who live free of knee pain. We use the latest advances in 21st century medicine to treat the underlying cause of your knee pain. Instead of masking the pain, we help the body heal itself. A critical component in restoring proper knee joint function is ensuring that the joint is lubricated. This program often uses a recently developed and clinically proven process that restores the natural joint fluid and relieves pain. Most customized treatment programs involve a series of weekly visits to our therapy area. During each visit you will be guided through the steps of your program by trained personnel. These steps may include specialized exercises, stretching, muscle conditioning, treatments using specialized equipment and/or direct adjustment by a practitioner. As needed we re-evaluate your progress and adjust your program accordingly. The goal of every program is to graduate the patient with the maximum possible improvement. We are also a Medicaid and Medicare provider.